The population of Fair Isle is around 55. On the day that I arrived on Fair Isle, two guests stopping at the Fair Isle Bird Observatory accommodation were getting married. The whole island was invited to their wedding. 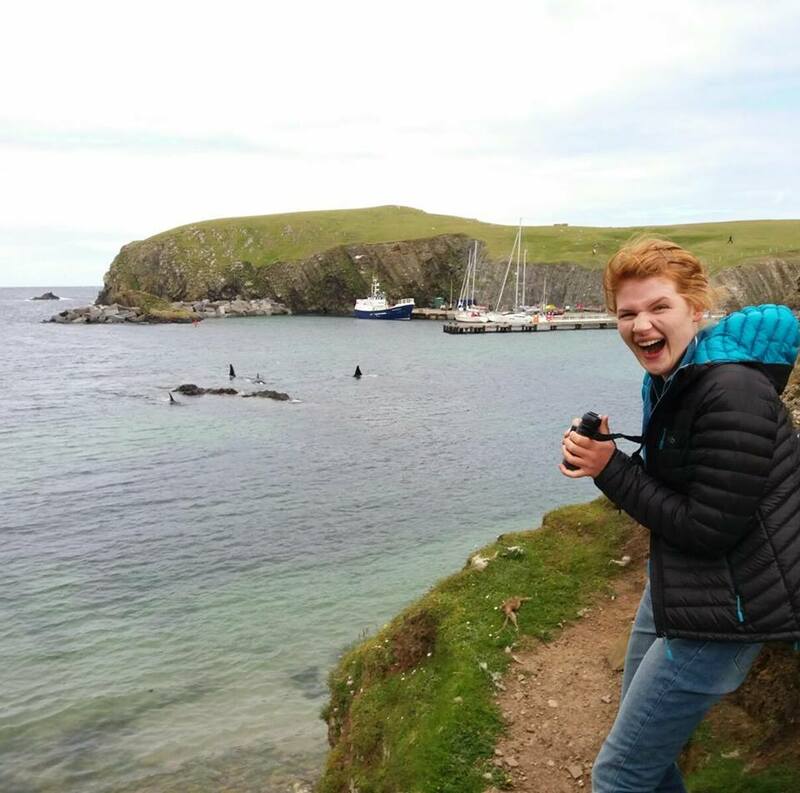 The turnout was good, but not half as many as those who appeared when a pod of eight killer whales were sighted off the coast of Fair Isle on Wednesday afternoon. They were first spotted in an area known as North Haven at around 14.20. At this time, I had just finished my lunch and was sat in the Observatory lounge drinking a cup of tea and contemplating what to do with my afternoon. All of a sudden, around the waters’ edge at North Haven, a couple of folk started running back and forth and making a fuss. We knew that something was up. At this point I had no idea what was going on, until someone shouted through the Observatory building ‘Killer Whales, North Haven’. I had never been in such a panic in all my life. I grabbed the necessaries, my binoculars and coat, and fled down to North Haven. In doing so I tripped over multiple times, there was no time to do laces! The rush was surreal. Trying to describe the excitement at this point is impossible, I was about to see my first killer whale! Not only this, but the pod was only around 100 metres from where I stood. ‘Where I stood’ is a bit of an exaggeration. I could barely stand up, keep still or shut up. We observed the pod in North Haven from 14.30 until 14.35. In swimming out of view, they left behind a bunch of giddy and breathless observers. Along with an injured seal, which towed itself across the bay before dunking out of view. 15 minutes later, we were treated to a second experience. The pod swam around the headland and into South Haven. There they displayed around the perimeter of the bay before carrying on south. Here, me and my friend Sarah watched from the headland above, meaning we got a bird’s eye view of the whales moving through the water. Flat areas appeared on the surface of the sea, we knew that an appearance was looming. The suspense was unbearable. You knew at any moment one would come into view. In South Haven, we watched them for around 20 minutes before they continued moving south. This time around, we drove to the south point of the island, where it was highly likely they were going to pass. And there they were. We scrambled down the cliff and across the rocks to get as close as possible to the waters’ edge. Again, they were a matter of metres offshore. Here we had the privilege of watching them for 25 minutes until they disappeared. The excitement and hysteria of seeing such a fantastic species, and so close, was incredible! Perhaps one of my greatest wildlife experiences. You can view photos of the pod, taken by FIBO staff, by clicking here. A video recorded by the FIBO.